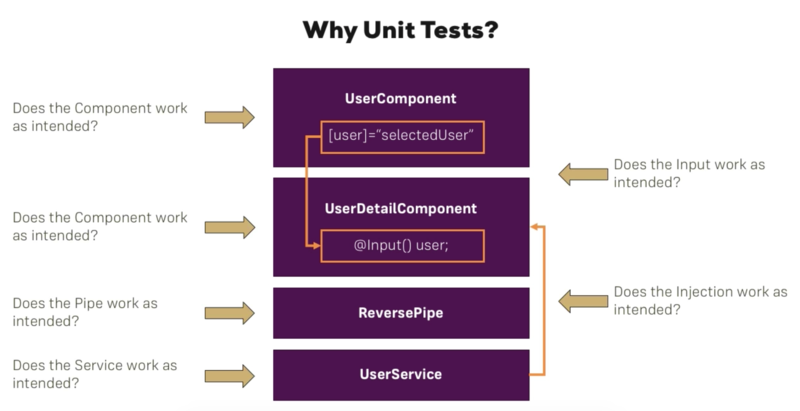 This Section only provides an Introduction to Unit Testing an Angular 2 App. 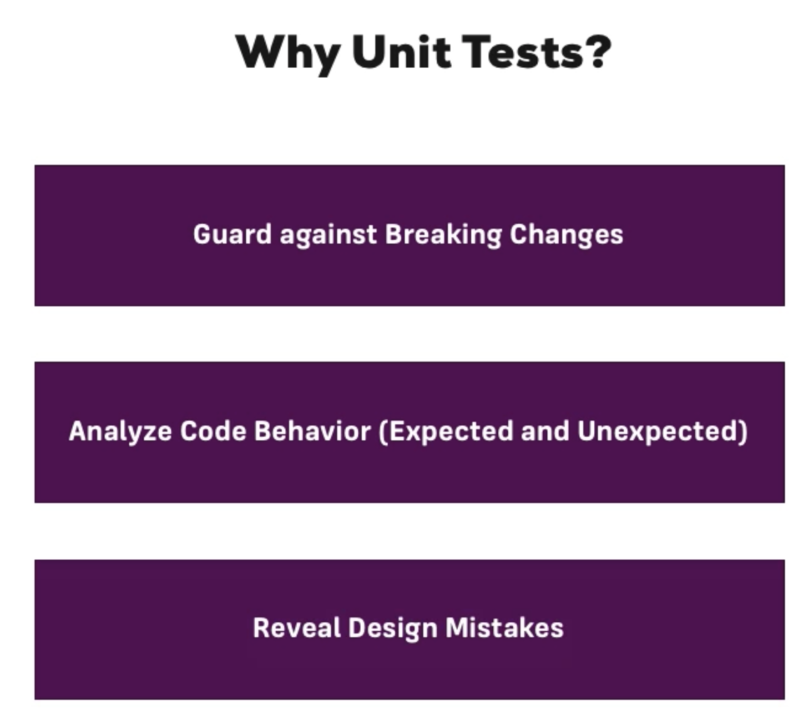 It’s NOT a detailed Guide about that neither is it a detailed Introduction to Unit Testing in general. Check out the “Further Resources” (last Lecture in this Module) to dive deeper into these topics. In order to simulate we need to run the app in the testing environment as it would be in the browser. Our test runner will mount the testing environment and will read spec files to execute the tests. In the beforeEach we configure the module for our testing with the TestBed utility. In the test we wrap tests with async method and we use fixture.whenStable to check the assertions. This Module only provides a brief and basic Introduction to Angular 2 Unit Tests and the Angular 2 Testing Suite. This Course isn’t focused on Testing. If you want to dive deeper, the official Docs actually are a great place to start. There you’ll also find a Non-CLI Setup! npm a great package manager, but npm has a great subset of functionality dedicated to running tasks to facilitate in a packages lifecycle – in other words, it is a great tool for build scripts. Another cool feature about npm is that any script that can be executed also has a set of pre- and post- hooks, which are simply definable in the scripts object. For example, if you execute npm run lint, despite npm having no preconceived idea of what the lint task is, it will immediately run npm run prelint, followed by npm run lint, followed by npm run postlint. The same is true for any command, including npm test (npm run pretest, npm run test, npm run posttest). The pre and post scripts are also exit-code-sensitive, meaning if your pretest script exits with a non-zero exit code, then NPM will immediately stop, and not run the test and posttest scripts. You can’t pre- a pre- script though, so prepretest gets ignored. will expand to mocha test/ --grep parser (which runs only the tests with “parser” in the title). In the package.json we have test:xunit which effectively runs mocha test --reporter xunit. This setup can be incredibly useful for composing commands together for some advanced configurations.
. You’d replace fooproject with your project’s name, and reporter with the config variable to override. – an entry in my ~/.npmrc appears (fooproject:reporter=spec) which is read at runtime, and overrides the npm_package_config_reporter variable, meaning that on my local machine, forever more, npm run test gets expanded to mocha test/ --reporter spec. I can remove my personalised setting for this using npm config delete fooproject:mocha_reporter. A good set up for this is to have some sensible defaults in your package.json – but your own customisations can be tucked away inside your own ~/.npmrc. (e.g. 1.1.1 -> 2.0.0). It’ll commit and tag up your package for you, all that is left is to git push and npm publish. 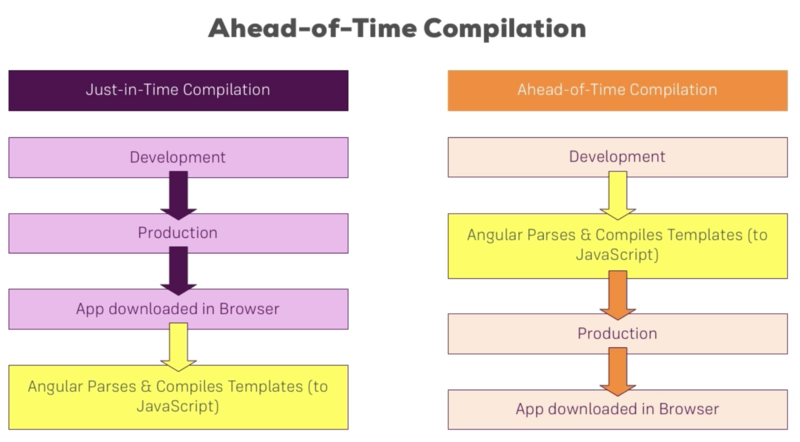 Using Modules in Angular is a way of doing easier to maintain an large app. We will modify our recipe book app to use multiple modules. NOTE: The imports in a component or service are not related to modules, it is a JS stuff to work. 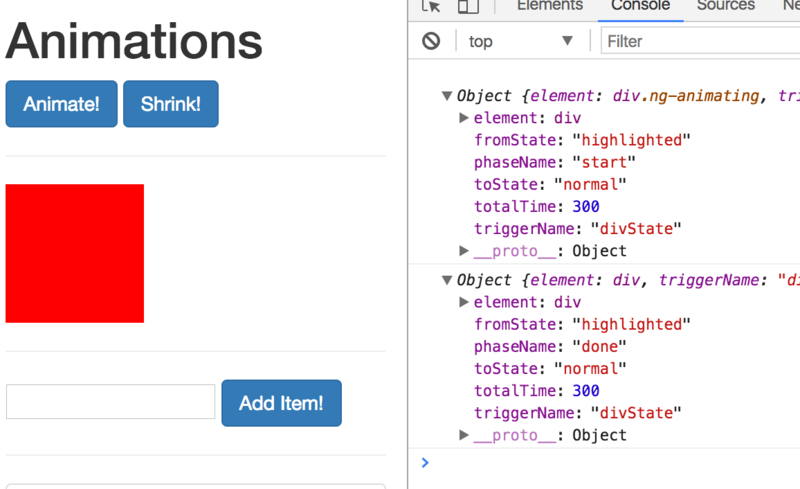 declarations : component , directives or pipes this module use. imports: other modules this module use (some Angular built in modules). When we import another module what that module exports. For example FormsModule export a set of directives , and importing it we can use all of that directives. providers: which service we are using in this module. Inject here will be provided for the whole app. bootstrap: whats our root component. It is about put all classes relate to a feature inside a Module, in our example Recipes Module can be a candidate. We create a recipe/recipe.module.ts to move all recipe related components to the new feature module. We also move DropdownDirective and ReactiveFormsModule into recipe.module.ts because these only been used in the recipes module. BrowserModule needs to be imported only in the app.module. 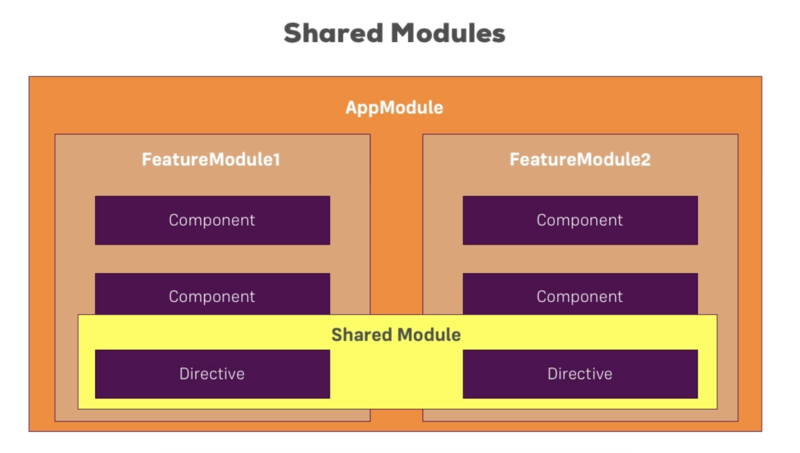 It contains all elements of CommonModule and additional stuff to start the app. 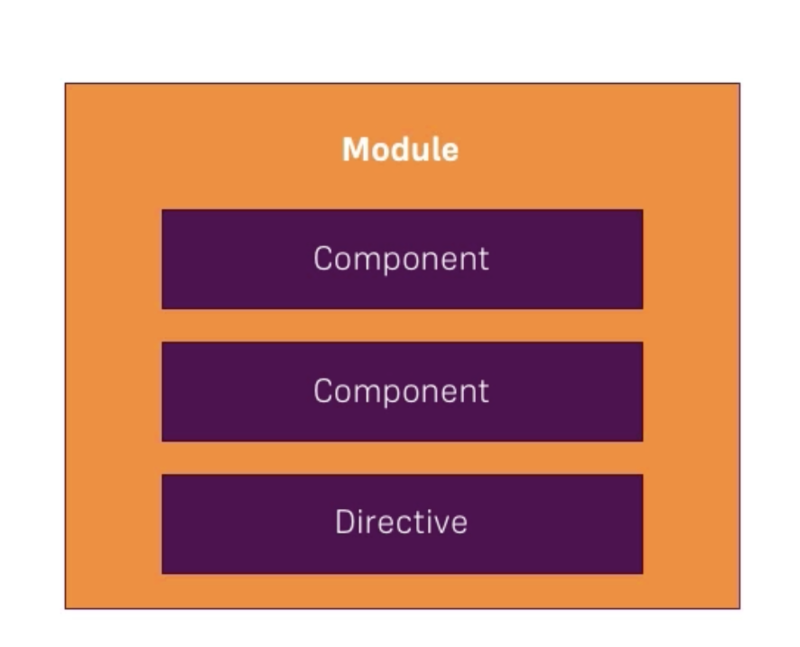 But use CommonModule for common directives in the others modules. IMPORTANT: You must not declare the same component in two different modules. But now we have a problem with the routing. Recipe module doesn’t have access to the AppRoutingModule, it is in the app.module and don’t travel down to the recipe.module. We will resolve it in the next point. The problem we havce is we are using router-outlet in some of the templates in recipe module but we are declaring AppRoutingModule. The solution is to create recipe/recipe-routing.module.ts for get all root configuration from the parent component and add all recipe relate routes. for link the new recipe routes. We create two new features modules: auth/auth.module.ts and shopping-list/shopping-list.module.ts. We cannot use app-shopping-list selector in app.component.html because it is not declared as part of the app.module.ts. IMPORTANT: only use selectors declared in the same module as the template. But with routes it is different. We can declare different routing files and use them anywhere if there is any place in the app where has been declared. 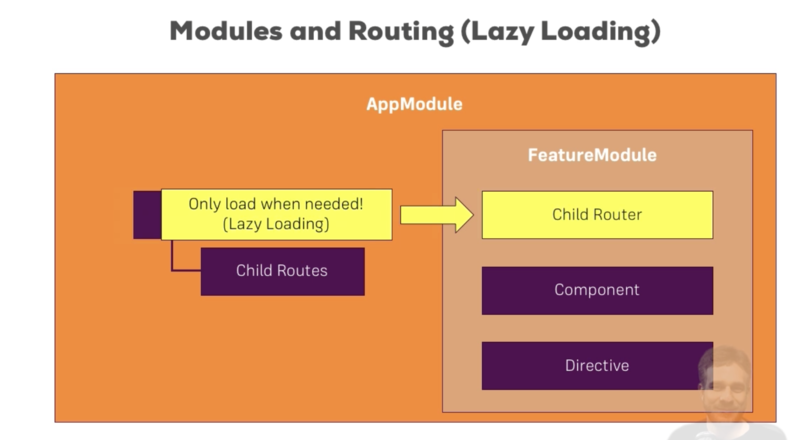 Lazy loading is about don’t load all the features modules at the beginning. It can happen user won’t visit some feature never so all the components related to that feature are not needed. We want Recipes Module to be lazily loaded. The first thing to do is create a home/home.component to set it up as the entrance point of our app instead of been redirected to the recipes. Then we remove RecipeModule reference from the app.module. What if you want to use route protection (canActivate to be precise) on lazily loaded routes? You can add canActivate to the lazy loaded routes but that of course means, that you might load code which in the end can’t get accessed anyways. It would be better to check that BEFORE loading the code. In this example, the AuthGuard should implement the CanLoad interface. 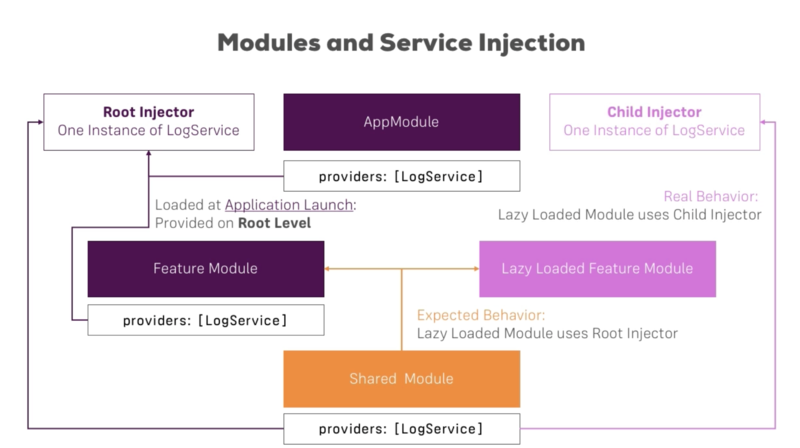 Services (LogService for example) can be injected in the Lazy Loaded modules automatically without need to specify a providers array. 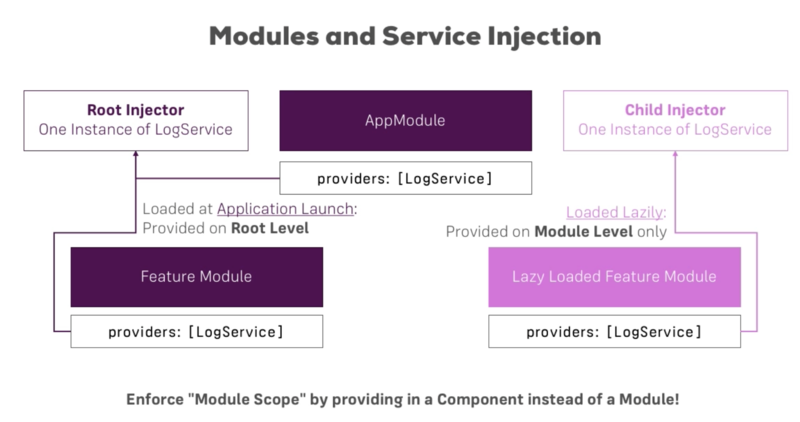 This is because lazy modules use the root injector which can be referenced from the whole app. But in this case a child injector will be created too, because lazy module is importing a module which has a providers array. Now we want to leave the app.module as lean as is possible. So let see what components belong to the core of the app: Header and Home. We create a core folder and we put inside header and home folders. NOTE : in the core.module we export Header component because we use the app-header selector in the app.component.html. But we don’t need to export HomeComponent because is only used in routes and in this case is visible from the whole app. We continue doing leaner the app.module. This time we are moving all the services in the providers array to the core.module. These services will still be available in the whole app because the core module is loaded at the beginning si it is in the Root injector. The AuthGuard service is only used in recipe module so we can define it only in that module. NOTE: Adding the AuthGuard service only to the recipe module we are improving the speed of the app in the bootstrap as Recipe module is lazy loaded. This step can be done before the app is released (without loosing the fact of some templates are dynamic). Templates get checked during development: all the console errors will trigger in the build process not in the user browser. Smaller file size as unused features can be stripped out and the Compiler itself isn’t shipped. Some errors can be triggered with this command you should resolve to get it completed. Once the command is completed a dist folder will be generated and you can check size of the app files: main.js and vendor.js and compare it with the sizes in the chrome console on development time. We can preload all the lazy loading modules , not at the time the app start but during user is using the app. In firebase console we need to enable basic authentication in the “Authentication” menu option. NOTE: In a normal backend you can have a available endpoint to retrieve a valid token but firebase hasn’t. There it is the accessToken we will using for make future requests. 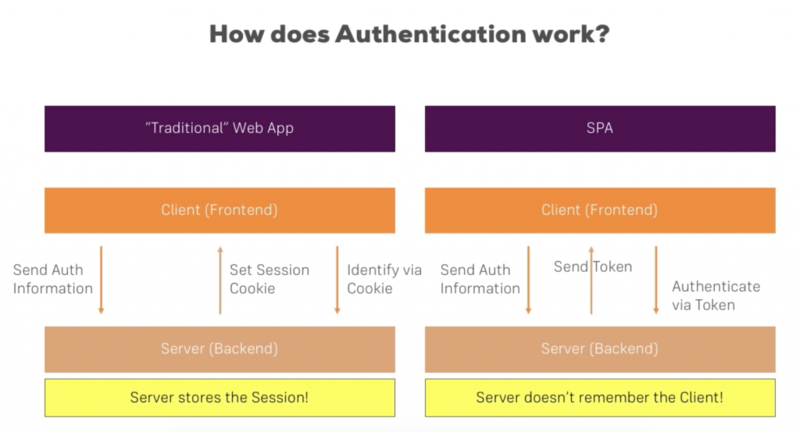 Now for making Fetch Data and Save Data action we need to append accessToken of logged users in the http requests. With the Angular Http class we can create Observables. But the request is not sent until someone subscribe to that observable. In the next example, we click on a button to subscribe to the POST method which trigger the POST request. Lets extract the data from the server response to render it properly. We can use map() (import rxjs/Rx is needed) for transform response from the server. What map method does is transform an observable in another observable. We want to catch request errors and print more friendly messages to the chrome console. We force and error removing .json at the end of the url. 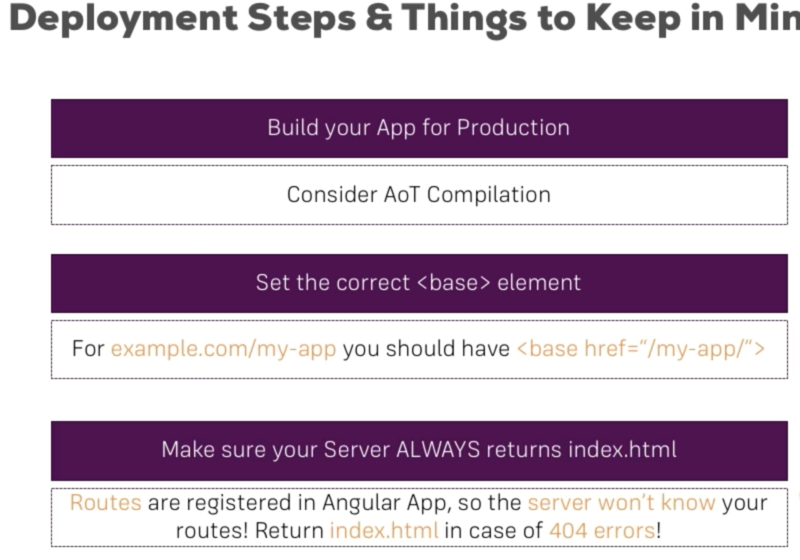 We explain here how to use async to render values depending of http requests. Out intention now is bind an HTML form to a Form object created programmatically. The first thing is tells Angular not to detect form tags and use my FormGroup created in Typescript. We use formGroup and formControlName built-in directives. Here we can use ngSubmit as in TD forms , but we dont need any local reference to the form. We already have reference to the form in the Form object created. We will use Validators class to pass static references to functions to execute on validation. We will use an array of Validators for making multiple validations. We will add hobbies dynamically as an input array. We will use formArray directive in the HTML and FormArray in the typescript. We will check candidate against a list of forbidden user names. NOTE: It is important return null on validator function as it is how Angular recognizes validation is ok. NOTE: We need to make bind(this) in the validators array for the custom validation for tells Angular to get the correct reference of the form control. We will customize error messages for custom validations. We will check errors property in the form.controls object. So we need to make an async operation , in this case we can pass to the FormControl constructor a third parameter telling Async Validators. We can monitor all the values and status changing in our form in every moment with two observables of the reactive forms: valueChanges and statusChanges. As in TD forms we can use setValue, patchValue and reset methods on the reactive form object. We can add pattern matching in template driven forms with the HTML5 pattern. The order is important because the types couldnt be the same. Lets filter the server listing by status by typing in a status input field. *ngFor="let server of servers | myfilter:filteredStatus:'status'"
If we add servers on a filtered list , we won’t see the added servers at the beginning. That is because filters are pure by default. Imagine we have values on the template that depends of async services. Then we can tell Angular to convert Promises in strings when promises are resolved with the async pipe. 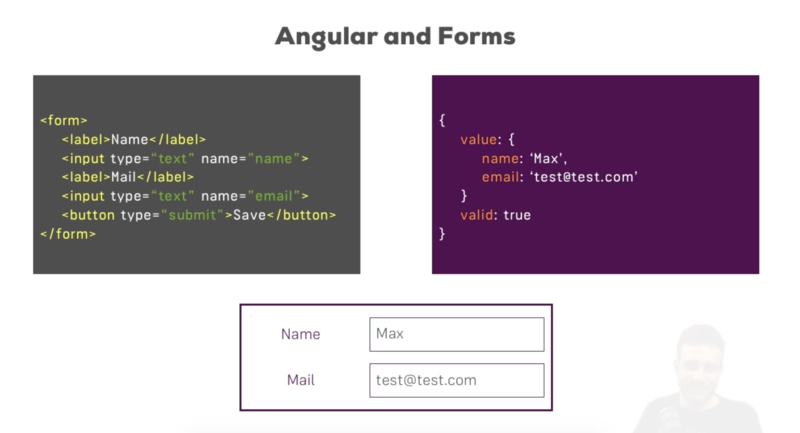 Regarding forms, what Angular does for us is giving us a object representation of the form in order to handle fetching data and form validation. And also we will be able to handle form submit without reloading the page (as it is a SPA). 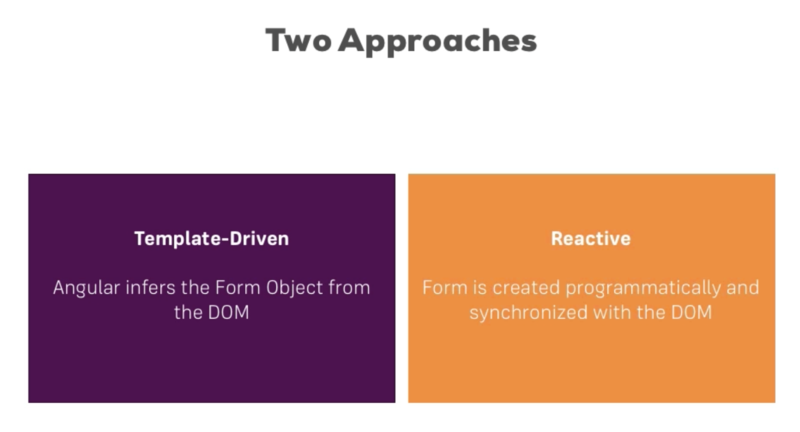 There are two ways of handling forms with Angular. With Template -driven we will resolve most of the cases, but with the Reactive approach you will have full control of the form and it is useful for advanced cases. In Template-driven approch we code all the logic in the template. Submit of the form managed by Angular is done by adding ngSubmit directive to the form tag and specifying the handler method. Otherwise the default behaviour will take place. Which Validators do ship with Angular? Check out the Validators class: https://angular.io/docs/ts/latest/api/forms/index/Validators-class.html – these are all built-in validators, though that are the methods which actually get executed (and which you later can add when using the reactive approach). For the template-driven approach, you need the directives. 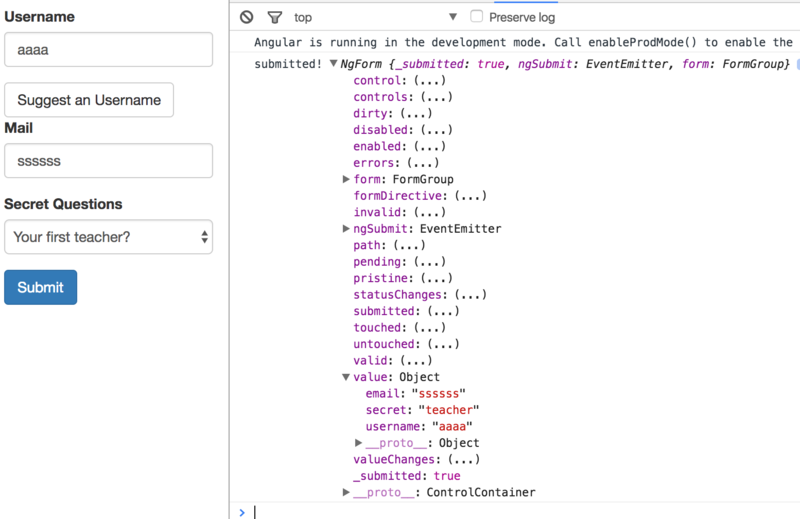 You can find out their names, by searching for “validator” in the official docs: https://angular.io/docs/ts/latest/api/#! ?query=validator – everything marked with “D” is a directive and can be added to your template. Additionally, you might also want to enable HTML5 validation (by default, Angular disables it). You can do so by adding the ngNativeValidate to a control in your template. We want in the elect input set “pet” ad the default value. We use property binding in the ngModel directive. Sometimes you want to react to changes in the input , so you need 2-way binding. You can also pass values to reset method to reset to specific values.